This week I received the latest Betty Crocker email newsletter with a recipe for Grilled Sour Cream and Onion Burgers - sounds yummy! The downside - 20 grams of fat. Since hubby and I are still doing "Lean and Green in 2008" I had to make some modifications to make this a healthier burger. It's still not the most low cal choice but with the additional fiber and fat free sour cream, it's still healthier than the original version without losing the taste. Hubby gave it two thumbs up! 1. In large bowl or stand mixer, combine all ingredients except hamburger buns. Form mixture into 8 patties, about 1/2 inch thick. Chill for at least 2 hours. 2. Heat gas or charcoal grill. Place patties on grill. 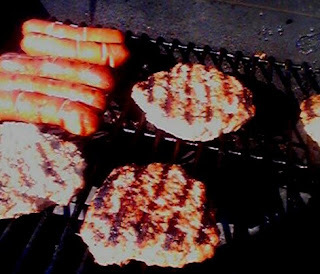 Cover grill; cook over medium heat 10 minutes, turning once, until meat thermometer inserted in center of patties reads 160ºF. Serve on buns with your choice of condiments.